Another day, another racist employee caught on tape. This time, we head to Newport News, Va., where an employee at a Radisson Hotel has been fired after he was recorded on video calling a Black customer a “f—ing monkey” during a dispute over a room. 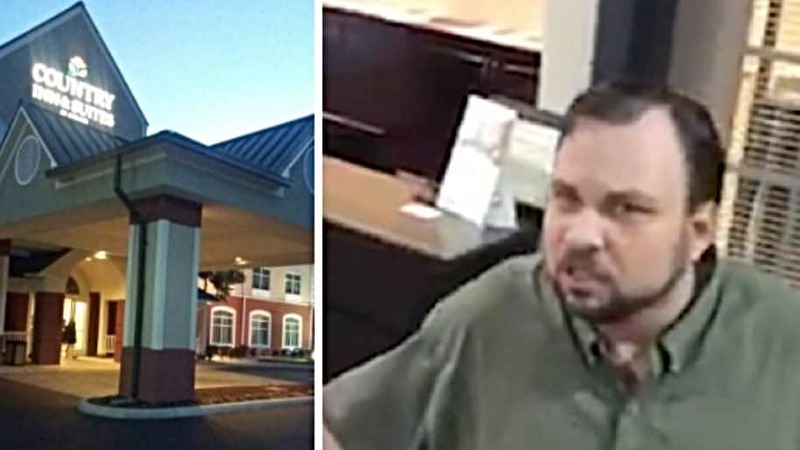 The incident happened last Friday at the Country Inn & Suites in Newport News. The hotel’s general manager, Lisa Little, said the employee was fired on Monday. “Why?” the customer, Irby Fogleman, asks, while recording the encounter. “Because you are rude!” the clerk yells. As he walks back toward the door to the reception desk, he tells the customer again to get his family and leave. There’s more back-and-forth arguing between the guest and the clerk. Fogleman told the Washington Post that he and his family went to the hotel Friday evening to hang out with his mother, who was visiting from West Virginia. When they arrived at the hotel room, the family noticed the smell of smoke. Fogleman said his mother is a non-smoker and he didn’t want his two small children to be exposed to the odor. When Fogleman’s girlfriend, Kelsey Cunningham, went to the lobby to ask for another room, she said the clerk was immediately confrontational and mumbled something under his breath. Cunningham said she was told that the only other available room had no air conditioner. Fogleman then went to the lobby to see if he could talk to a supervisor. The clerk told him there was no one else he could talk to, Fogleman said. He then took a business card from the reception desk, sat down at a nearby chair and began sending an email. When another customer came to the front desk to complain that he had no TV in his room, Fogleman said that the other customer, who had heard him talking to the clerk minutes earlier, looked at him as if to share their mutual dissatisfaction. Fogleman shrugged his shoulders and said, “See?” as if to agree with his fellow customer, which set off the clerk on his angry tirade. After the incident, Fogleman said he and his family immediately left the hotel. Fogleman is just the latest black person to be reminded how real race is from a business. Last month, two black men were arrested at a Philadelphia Starbucks for sitting and waiting on a business partner. Chikesia Clemons was violently arrested after asking why she had to pay for plastic utensils at an Alabama Waffle House. Also, last month, two black men were wrongly accused of not paying to use an LA Fitness gym in Secaucus, N.J. prompting police to once again be called. And a motivational speaker was kicked out of a Dallas restaurant because the manager “didn’t like” him and wanted him to give up his table.